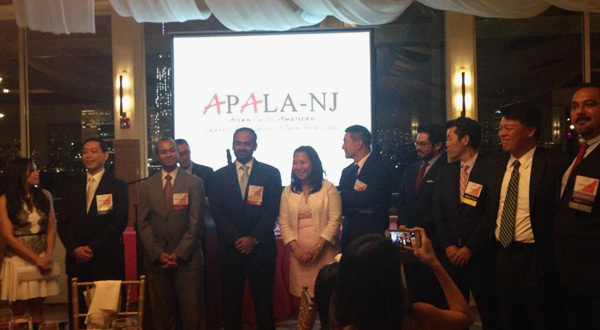 APALA-NJ, founded in 1985 and incorporated in 1993, is the largest specialty bar association that collectively represents the interests of Asian and Pacific American lawyers in the State of New Jersey. According to the Census Bureau, over 650,000 Asian Pacific Americans reside in New Jersey, representing nearly eight percent (8%) of the total population of New Jersey. From 2000-2007, there was a 32% increase in the State's APA population and every county in New Jersey experienced double-digit growth of the Asian Pacific American population during this time period. This trend continues as APAs settle in New Jersey to meet the State's growing demand for a strong workforce that meets the needs of the state's employers. Promote & support a positive image of Asian Americans. Educate members and the community about issues of critical concern to Asian Americans. Support the entrance and advancement of Asian Americans into and within the legal profession. Provide opportunities for members to network with others in the Asian American legal community. Encourage members to communicate with New Jersey's Asian American community.